There 3 free packs for GRAW 2 as well, Throwback 1 and 2 map packs and the more guns for single-player pack. EA SPORTS game hub is now availble to download free. Download EA SPORTS to gain access to new EA SPORTS features and programs only available here, such as EA SPORTS Season Ticket. EA SPORTS Season Ticket gives you 12 months of exclusive access and discounts to popular titles, including FIFA, Madden NFL, NHL®, Tiger Woods PGA TOUR®, and NCAA® Football. Had a look at that, I think it's just for letting you have early access to games and content ,still have to purchase of course and no discounts? more of a ''hey look its EA Sports!'' attention grabber. Oh well I do love free stuff, but its like getting blood from a stone. Just my opinion, but I always thought that at least every new game you buy should come with a dash theme and 1 gamer pic. But then I am greedy! Must have been a glitch, or 1-day only freebie. 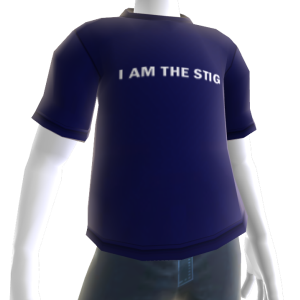 Free Top Gear "I AM THE STIG" Avatar t-shirt via Facebook (usually 80 MSP).